A month ago, one of my friend Linden confided in me that his two new favorite restaurants of the year were LudoBites and Animal. He and his lovely fiance, Amy had invited a group of us to LudoBites and showed us around on what to order at one his new favorite place of the year. It was a fantastic meal that night as we ordered almost everything in the menu. 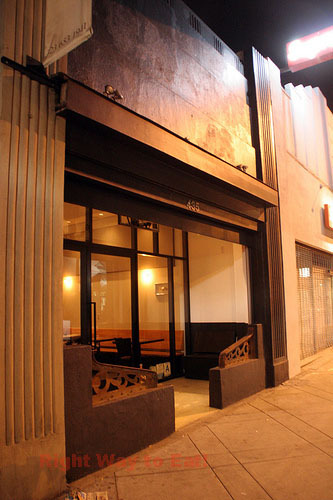 Given that the success of that meal from LudoBites was an excellent choice by Linden, I was more than curious about his other choice for the favorite "new place" of the year where he had mentioned about the decadent foie gras that was served here and the pork belly that was to die for. It doesn't take me very long for my head to come up with a bright idea to visit Animal very soon. It comes very naturally I guess to suggest that I would like to visit this place to see if it fulfill the same satisfaction as I had at LudoBites. The much ballyhooed and acclaimed chef duo of Jon Shook and Vinny Dotolo known as the "Two Dudes" because of their TV show on the Food Network, which they have shown their audiences to defy conventional cooking as they have ushered in new ways of cooking for traditional American cuisine. Discussions about categorizing their food as New American would be still be too conventional for them as they continue to push the envelope on re-inventing the old classic dishes. In many ways, the Two Dudes reminds me of the "Too Hot Tamales" of Mary Sue Milliken and Susan Feniger. Just like the Tamales, the duo of Shook and Dotolo worked in the same restaurant before traveling to a new city together. In fact, the funniest similarity is that Shook and Dotolo both became TV personalities at Food Network on a show called "Two Dudes Catering". Just like the Tamales were able to do early on in their career was to reach to vast audience in define a niche for themselves and expose the type of food they want to cook. The show worked out very well for the Dudes as it gives them both a chance to exert their personalities in their cooking without the retread of boring conventional cooking methods. It's an entertainment for the television broadcast, but does the unconventional cooking methods worked in the kitchen? Throughout the night, I would get to see how the free spirited chefs with no boundaries and have many times on their show proclaimed "they play by their own rules" would leave their indelible mark in their cooking. In some way, it works. While other times, it left me wondering. One of my friend Holly from The Michelin Project and her good friend Kat's 9 Lives had invited a few of their friends from the OC and various Yelpers to complete this dining extravaganza. We had a dining companion who was very well versed in ordering wines for our tables because the selections of wine was very limited in the menu. That was one beef I had with this place because the few wine bottles we had ordered doesn't seemed to fit with the courses we had (which the wines were suggested by the staff) . In matter of fact, one of the beer our dining companion chose was much better suited than the two wines we had ordered for majority of the dishes. 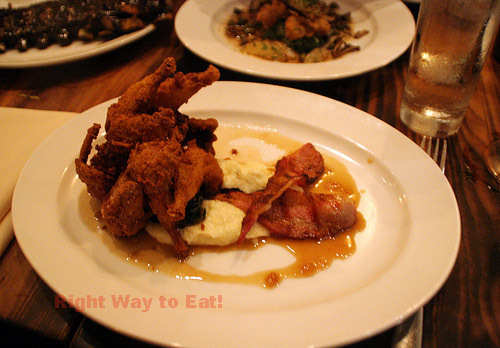 One of the dish that was agreed upon unanimously before we even looked at the menu was the pig ear. I think everyone was giddy because they thought it would be soft and tender like a liver. 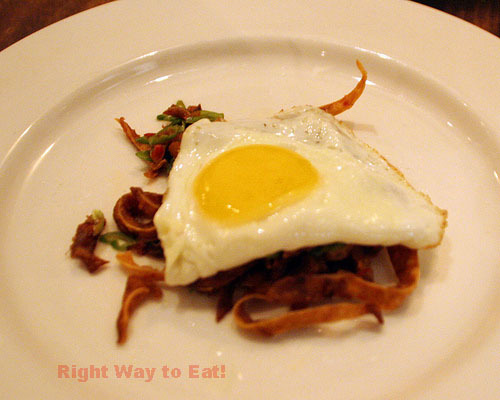 The ear was cut like a shredded strips and was topped with a fried egg. 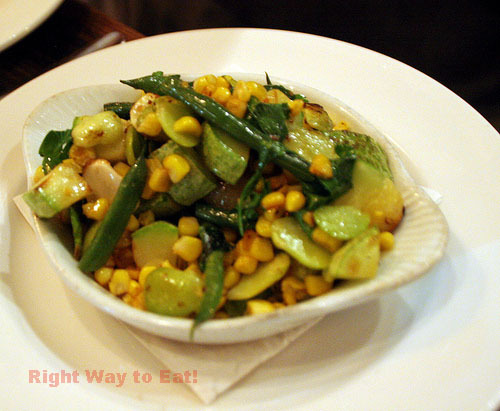 The playful look soon gave way to the chili and lime that accompanied the pig ear made it more spicy. The new hot taste was exciting and added an unexpected element to this exotic dish. 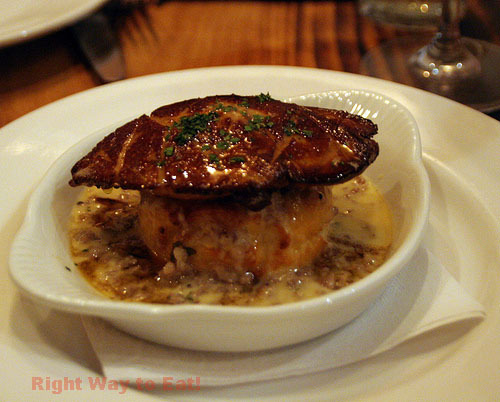 The big hoopla of the night was the very first dish that came out: Foie Gras with maple sausage gravy on top of the biscuit. The Foie Gras was cooked just about right where it delicately place on top of biscuit where it can be easily cut as it was very tender and would melt instantly right in your mouth. 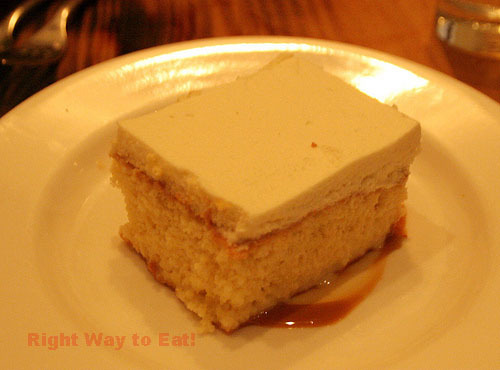 Once you take a bite of the foie gras, the flavor just exploded right into your taste buds. The maple sausage gravy was something I couldn't stopped eating as well. 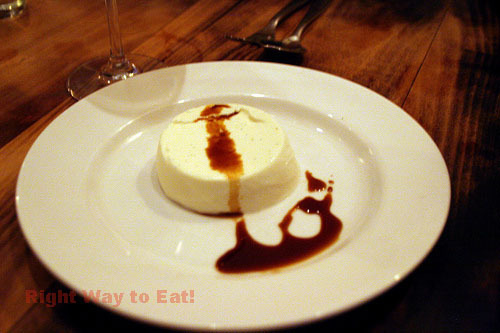 It's not quite mushy like an average puree, but was very creamy with delicious bold flavor. The sausage is part of the supporting cast of the maple flavored gravy. Both worked with the biscuit, as all the components comes together for the foie gras. One of the more inventive dish of the night was the kimchee pork belly. 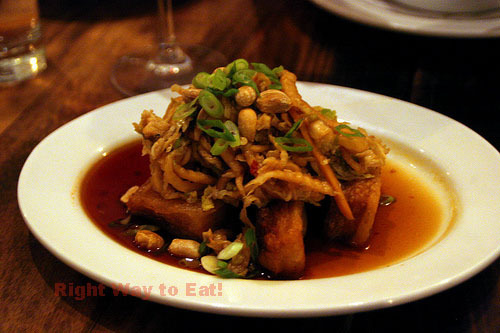 The pork belly was an absolute delicious succulent piece of heaven you want to repeatedly eat all night long. Their interpretation of of adding kimchee salad reminds me of an abstract Ceveche salad with pork belly replacing the hot shrimps as the components. This is one of the dish that I thought the Two Dudes was able to redefine and made it one of their own. It was very unique in the fact they incorporated a Korean dish onto their menu and remade the pork belly dish as a fine example of anything goes with it. Two other things that goes well with pork belly, the second wine we have ordered and the cold slaw. Finally, the wine have worked with a dish. 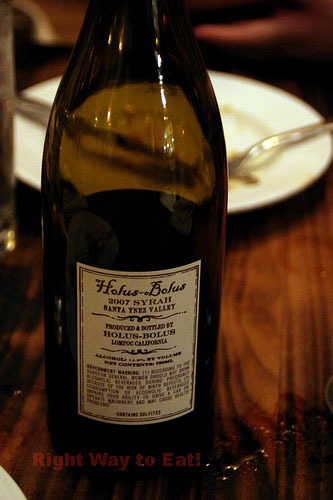 We ordered a syrah (Holus Bolus) which has a nice robust flavor in the wine that compliment very well the pork belly sandwich we have just ordered. 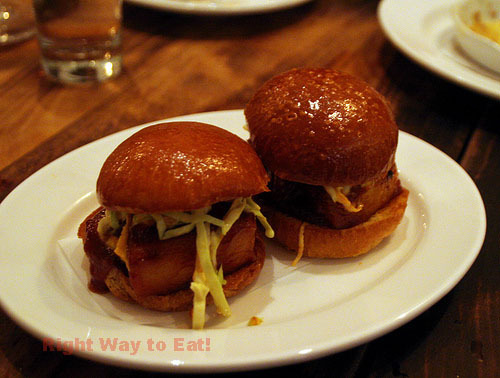 The cold slaw replaced the lettuce as the pork belly sandwich became Animal's version of a mini slider. Fine interpretation of a classic burger? Perhaps. $10 for each slider? That was the reason it gave me some pause. The main courses are for most part the big attraction in wanting to fill up the tank while emptying your wallet. 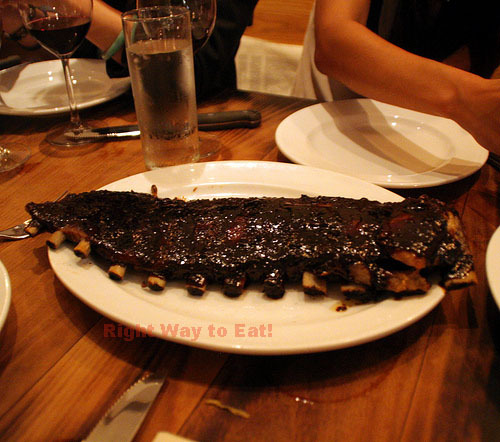 Their Balsmic Pork Ribs are excellent and very tender where the meat just fell off the bone. Well prepared and seasoned, it was one of the big surprise of the night. For $37, it was also the one dish that we were watching our budget. To go splurging without a discern taste, yes it would be worth it. Value for the price? To make that call, let's see if any pork ribs would cost that much in real life and judge it from there against other ribs. (To be honest, I had better ribs that was for half of the price for the same size of slab of ribs). 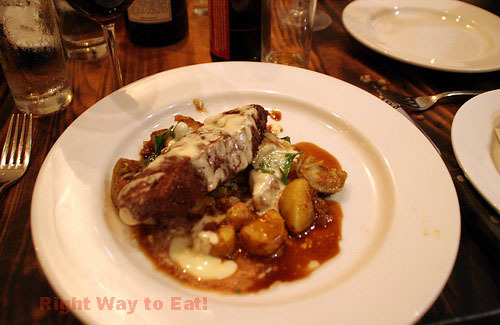 Two of the more challenging dishes were the sweetbreads and the quail leg. Let me get to the positive first about the quail leg, I thought that was the best main course of the night. Probably slight edge over the balsamic pork ribs. I thought it was very well breaded and very juicy in the meat that for a few second you would forget to swirl it around the maple jus. You probably don't need it as it can be a standalone dish without too many other components in that plate. 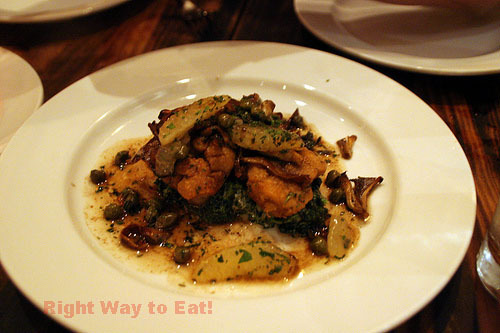 Unfortunately, it can't be said for the sweetbreads and the flat iron. From the look of the photos above, both dishes were surrounded and ganged up by supporting elements that was probably needed to cut down by two to three ingredients. The sweetbread isn't a main course, but might as well be enjoyed as such. It had a mushroom of Hen of the Woods (pretty much known as "Maitake" mushroom) where it got lost in the plate as other garnishes were all over the plate. The flat iron suffered a worse fate, the truffle parmesian fondue overwhelm the smell and flavor of the steak. Its taste totally got lost where I'm not sure which component of that dish was suppose to be the main one, even though the flat iron was the first item listed in the dish. For most part, a lot of these garnishes or ingredients could have worked. In all confessions, I did like the sweetbreads and quail legs by itself. If it is needed to add other components, it's still would be fantastic dishes. Forced upon to eat it with the said garnishes and ingredients, many of our dining mates wound up scrapping it off and leave it on the side. Eventually, maybe we can dipped it in the sauce or eat it separately. The deserts are probably on par with some of my favorite restaurants, but would not be in the same class as some others (Melisse, Providence) that can end the night on high note. Yes, I could definitely say that Panna Cotta and Tres Leches were interesting desserts, but lack the high expectancy of the tartness we usually come to expect from these two popular desserts. My favorite desert (and the most ignored in our table. *sigh*) was the bacon chocolate. I was in love with the bacon as it had a bit of the salt. 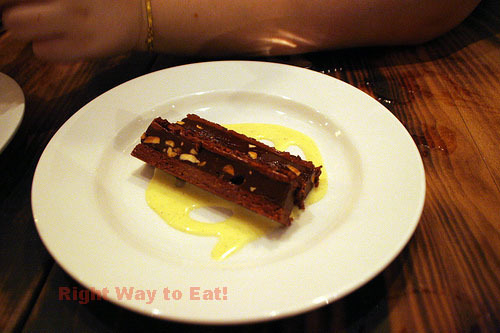 It tasted very delicious with the chocolate bar and with the crunchy bar dipped in that Anglaise cream is an absolute delight. The Bacon Chocolate bar is probably the only thing that prevent me from disregarding the entire deserts lineup. I do think their style of cooking would be greeted by the masses that are looking for something unconventional, but yet tasted so delicious. In retrospect, I did think most, if not all of their dishes were well thought out and were fantastically delightful when the place reaches the table. 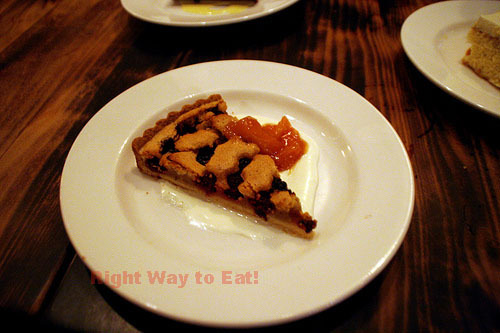 Presentation of the garnish on certain dishes can cut back a little to showcase the main proteins on the dishes. If they can figured out on how to get more wines that matches with their dishes, they make a killing in this place with alcohol. Beer selections that include IPA is on hand. Seriously, no joke on this one, the beer worked wonders that night with so many of the dish which I have to say the selection of Paulaner Hefe-Weizen is the best. One more thing, Mexican Coke is served here. When they start serving Mexican Pepsi, I'll surely be back in an instant. B-?! I faint at the low score. I love this place. Thanks for the shout out Mike. Have to say I loved the Quail Fry. Better than any fried chicken I've had. I don't think the house smoked pork belly is on the menu anymore but that was an absolute winner too. You're such of an overachiever in school. B minus is still a very good in my books. I'm sure you would not settle for anything less than A in school. A = awesome, excellent, Perfecto Mundo. C= Good, On par in what I expect. You're very welcome! Thanks again for the suggestion of this place. You're on Fuego lately with all these dining choices. I'll see you and Amy very soon! haha, funny picture of me. 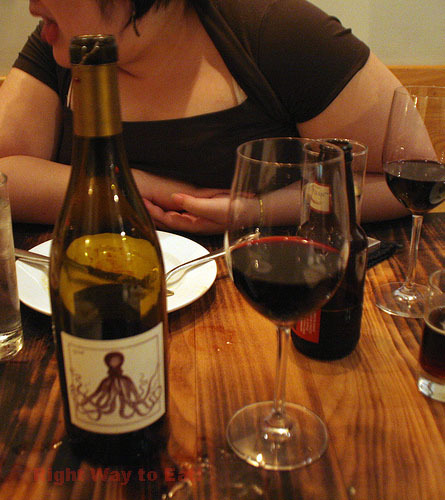 but you're right, not sure if it was the hodgepodge of items we ordered, but neither of the wines were great pairs. the syrah was definitely better though. 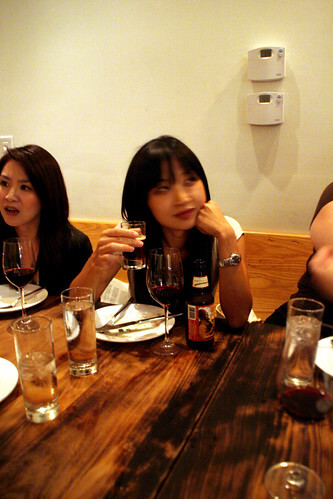 Yeah, the wines were weird fit and the syrah was definitely the best bottle of the two.